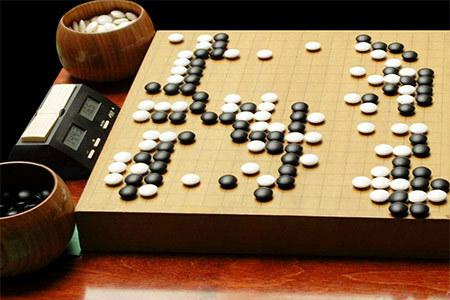 The first round of go competition at the 4th SportAccord World Mind Games on December 11 featured an epic encounter between the Korean and Japanese men’s teams, and a historic victory for a Russian woman. While Yuki was winning on board one, it appeared that Japan would also win the battle between two young players that was taking place on board two. Japan’s Ida Atsushi, 20, is a fighter who is good at killing stones, and that is what he did to a white group at the bottom of the board in this game. Facing what looked like certain defeat, Korea’s Na Hyun, 19, temporarily abandoned his stricken group, and this turned out to be the right decision. Later in the middle game Ida overplayed his advantage by starting an unnecessary ko fight, in the course of which Na was able to revive his dead group. Pressing on through a further exchange of groups, Na evened the score in the match at 1-1. All now depended on the outcome of the game between Seto Taiki of Japan (at right in photo at left) and Korea’s Kang Dongyoon (left) on board three. Kang, winner of the individual gold medal at the 2008 World Mind Sports Games, the Fujitsu Cup in 2009, and a SportAccord silver medal in 2012, brought the better credentials to the game, but Seto kept it close from beginning to end. The people following the action on the monitor screens in the adjoining room were held in suspense down to practically the last move, but after a grueling five and a half hours, at about six o’clock, the referee counted Kang the winner by 2-1/4 stones (equivalent to 4-1/2 points by Japanese counting). Meanwhile, the Chinese team of Shi Yue, Mi Yuting, and Tuo Jiaxi was dealing unmercifully with the European team of Fan Hui, Aleksandr Dinershteyn, and Ilya Shikshin. European stones died en masse on all three boards. The team from Chinese Taipei also blanked the North American team 3-0, although the game between Chen Shih-Iuan and Jiang Mingjiu on board one was quite close. None of the losing players appeared upset by their losses, however, and one Russian player looked positively joyful about his defeat. That was Ilya Shikshin (right), who had held the lead for awhile against Tuo Jiaxi, as the latter admitted after the game. This was a gratifying contrast to the complete thrashing Ilya had suffered at the hands of the same opponent in 2012. Even happier was Russia’s Natalia Kovaleva, who defeated Chinese Taipei’s Cathy Chang in the women’s individual competition. The game was unusual for its lack of fighting. Natalia won this exercise in harmony by the same margin by which Kang had beaten Seto. This was not the first time she had defeated a professional opponent – she had also done that in Beijing in 2008 – but it was the first time any European woman had beaten a player from the Far East at the SportAccord World Mind Games. Her reward will be a game against a stronger Far Eastern opponent in the second round: Choi Jeong, the bronze medalist in 2012 and more recently the victor in the Bingsheng Cup.